With Easter on our doorstep, maintaining a balanced and nutritious diet often hops out the window along with the Easter bunny! The Australian Dental Association (ADA) urges all Australians to watch “That Sugar Film”, which aims to raise awareness of the effects of a high sugar diet on a healthy body. “That Sugar Film” sees Damon Gameau embark on a 60 day experiment to consume the equivalent of 40 teaspoons of sugar each day – the average amount of sugar consumed by Australians daily. However, he must consume foods that have ‘hidden sugars’ – that is sugars found in commonly perceived healthy foods and drinks. He does NOT consume junk food, soft drinks, confectionary, or ice-cream. 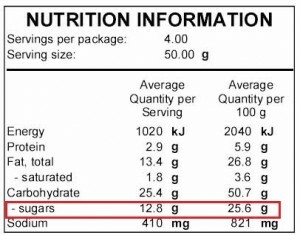 The sugar content of some foods – foods that the average Australian would think are healthy choices – is quite shocking. During this experiment Damon continues to exercise and eat the same amount of calories each day as he previously did, however the impacts on his body and health are massively different. The trailer can be viewed below or via this link. Some foods and drinks do not fit into the Five Food Groups because they are not necessary for a healthy diet and are too high in saturated fat and/or added sugars, added salt or alcohol and low in fibre. These foods and drinks can also be too high in kilojoules (energy). Many tend to have low levels of essential nutrients so are often referred to as ‘energy-dense’ but ‘nutrient-poor’ foods. The problem is that they can take the place of other more nutritious foods. It is easy to have too much and too many of these foods and drinks, and many people do. Have you ever wondered how much extra sugar you might be consuming in those yummy Eater treats? As well as causing tooth decay, sugars in our diet also contribute to a range of general health concerns such as obesity, high cholesterol and diabetes. Understanding nutrition information panels and how to interpret the information they are providing us with is an interesting and valuable tool to have in maintaining a healthy diet.